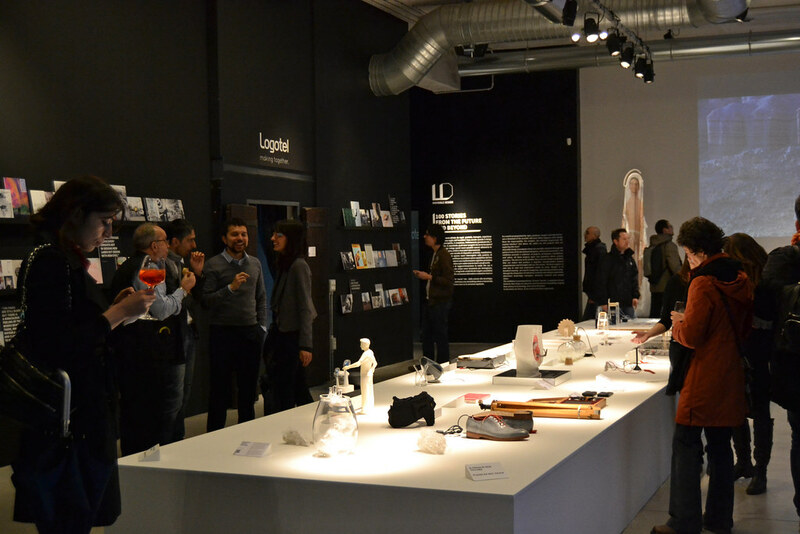 Quick update: “Curious Rituals: gestural interactions in the digital everyday”, the book and our short film, was shown few weeks ago in the Logotel’s (In)visible Design – 100 Stories from the Future and Beyond, an exhibition for Milano Design Week 2013. Thanks again Stefano Mattei and Francesca Rizzo! Besides, it’s now possible to buy the book on lulu. In order to produce anything, you need three elements: an idea, the means to make the idea, and the money to pay all concerned. For these reasons it comes as no surprise that the entrepreneurial explosion of the early 2000′s has focussed on software. Once the idea is solidified, the manufacturing and shipping of a software product, whilst not exactly simple is at least attainable by a small number of people with basic equipment and minimal outlay. In the world of object production the idea is the least of your worries. Atoms, as it has been said many times before, are difficult to wrangle, the engineering infrastructure, commitment level and financial outlay is significant. Even for a tiny plastic widget the initial tooling can run into many thousands of dollars. There’s a change afoot in the world of atom wrangling however, and it’s name is 3D printing. I saw my first 3D printer whilst working at Dyson in the 90′s. I remember it very clearly. The workshop acquired a 3D printing machine which arrived to great fanfare and was duly installed into it’s own dedicated room, similar to an early computing system. A modelmaking technician was assigned and he undertook a lengthy programming and maintenance course. The machine was a Fused Deposition Modeller (FDM) which functioned by squeezing a thin bead of plastic around a pathway, then moving up a tiny amount and producing the next layer. By contemporary standards the models took an age to make, and due to the FDM process the models were very wobbly. Dyson still employed a permanent team of modelmakers to fill, sand and paint the parts to make them suitable for use. Fast forward to 2001. I was working at London design consultancy Seymourpowell when I used my first stereolithography (SLA) part. It cost a fortune, we had to contact an outside agent to produce it, and it took two or three days to arrive. We wore gloves to prevent the moisture in our fingers from warping the part, and it was so fragile we moved it around the model shop like a piece of fine china. Fast forward again to today. In our studio we have a couple of 3D printers, one prints out a wax-like substance and the other prints in full color onto a bed of what looks like talcum powder. A standard phone-sized part takes about an hour to make and and hour to dry and treat. We now print things out every few days or so, and (pretty much) don’t think about the cost. There’s even an entire magazine dedicated to the subject. Tenet 1: items can be produced quickly In the world of Industrial Design, there’s a reason why 3D prints are regularly referred to ‘rapid prototypes’. Compared to the timescales involved with traditional model making, 3D printers are able to generate a solid approximation of the desired form with amazing pace. Time from CAD to ‘thing in the hand’ is very quick, comparatively. However, this notion of ‘rapid’ seems to have caused some confusion in journalists and has been reappropriated to represent not prototyping but manufacturing. In the world of manufactured objects, heated plastic is pushed, pulled, inflated and squeezed into tools to produce everything from bottles to cellphones. The most popular form of plastic manufacturing is injection molding. When compared to the entire cycle time of injection molding (including tooling, polishing, injection and cooling) the 3D printer is indeed quicker, but once the injection tool is finished, there’s just no contest. Cycle times for industrialised injection molding machines can be lower than a second, and if you want to produce anything at scale it’s still the only sensible choice. We should also talk about quality, as it’s no good just producing an object, it needs to be produced with integrity. In a world populated by iphones and BMW’s a 3D printed object just doesn’t have the aesthetic oomph required to compete. Structural integrity is also significantly sub par, the lack of an internal homogenous crystal structure means 3D printed parts are brittle and unstable. When comparing speeds, we need to be very careful that we’re comparing like with like, and it’s unfair to put to both techniques in the same category. 3D printed parts may be produced ‘quickly’ when compared end-to-end with injection molding, but at commercial scale they fail on almost every level. Tenet 2: a user can print whatever they want This is perhaps the most potent promise of 3D printing – empowering individuals as makers through the democratization of manufacturing tools. (There is a larger ‘maker movement’ behind this promise, borne from numerous hacking, artisanal and fixing communities, which we may delve into at a future date). The freedom created by 3D printing is not limitless though, and whilst Obama refers to ‘almost everything’ we should take time to understand the true parameters of this technology. Firstly, current 3D printers are bounded by their space envelope. The Replicator 2 can print objects of 28.5 x 15.3 x 15.5 cm. There are larger devices, but typically the print volumes are around that of a microwave oven. Anything larger needs to be made in pieces and connected afterwards by bonding parts or mechanical joints. Secondly, 3D printers typically produce objects from polymers. There are advances in metal 3D printing but these are fairly limited (a quick look at ’3D printed metal’ as described on the Shapeways site will give you an idea how complicated the process is). Thirdly, products such as the Makerbot can only print one colour at a time, this can be changed but a new colored filament needs to be threaded into the machine for each color break. Other printers can produce a wider variety of colors, but the resolution and vibrancy is pretty poor. Also, every part produced in a 3D printer has a rough, matte surface, which needs sanding and painting if gloss is desired. So if our definition of ‘whatever’ fits those material, finish and volumetric constraints, we then need to ask the question about where the 3D data comes from. 1. data made at home, printed at home. This is the realm of the tinkerer, the maker, the hobbyist. As a totally non-scientific example of the sorts of things we’re talking about, take a look at Brendan Dawes tumblr, which I feel is fairly indicative. This group typically makes two types of object: the art piece or novelty, or the specialised functional addition. As a tool for the individual maker, a 3D printer is very exciting. In this model, the 3D printer sits in the same space as any hand manufacturing technology, from carpentry to welding. I think this is where 3D printing has a significant future. Allowing people to make fun little things for themselves, or fix a little doohickey is perfect. That’s the DIY fixer mentality, and I like it. This hands-off approach to culpability cannot last long. If you design something to go into someone’s bathroom, it will make it’s way into their childs mouth. If someone buys, downloads and prints a case for their OUYA and they suffer an electric shock as a result, who is to blame? If a person replaces their phone case with a 3D printed one, and it doesn’t survive a drop to the floor, what then? We need to create a new chain of responsiblity for this emerging, and potentially very profitable business. When people want to print cases for their Raspberry Pi it’s smiles all round, but the questions raised by the heavily publicized ambitions of Cody R Wilson to 3D print gun parts through his DEFCAD site have opened the debate about what type of objects are printed as opposed to the quality thereof. Whilst I understand that 3D gun parts could be cause for concern, I think they are inevitable. We need to understand that if we make the tools available, people will use them. The early days of desktop publishing saw calls from professional graphic design associations for the registration and licensing of desktop printers, in an attempt to curb a rising tide of ‘bad design’. This type of regulation was obviously impossible to enforce but we’re seeing similar efforts by lobbyists and the makers of 3D printers. In a strange puritanical brand protection exercise, Cody Wilson recently had his personal 3D printer repossessed by Stratasys for printing the lower receiver of an AR15 assault rifle. Gun parts fall right at the end of the bell curve, but if we allow people to make anything, then they will make everything. We will find it impossible to regulate what constitutes an ‘acceptable’ or ‘unacceptable’ part sooner than we think, but let me leave this section by asking the following question: is a right wing crypto-anarchist distributing weapons data any more dangerous than unregulated, uncertified printed plastic parts finding their way into our offices, homes, cars and kitchens? The story unfolds thus: if we only print what we need, if we produce objects at the source and cut out the shipping, if we allow people to mend rather than buy new, 3D printing will have a significant positive impact on the environmental footprint of manufacturing. If we feel that allowing individuals to produce their own plastic parts will in any way reduce the impact of manufacturing on the environment we are kidding ourselves. Allow people to print plastic and that’s what they will do. A LOT. A quick look at the Shapeways catalog tells you what people want to print. It’s not replacements for existing parts, it’s just more stuff. Plastic furniture for their dolls house, plastic bottle openers, plastic stands for their ipad, plastic bracelets, even TINY PLASTIC VERSIONS OF THEMSELVES. Implying that individuals will in some way help reduce plastic use by only printing what they need is naive indeed. As they say at Forbes: “Why settle for wearing the same glasses every day when you can print a new pair to suit your mood?“. 3D printing may cut out the shipping element which may have a slight environmental plus, but the plastic still needs to be shipped to your house in spools. The waste produced in the manufacture of 3D printed parts can be significant, and often toxic. We also shouldn’t forget that designers and mass manufacturers have many years of experience in the most environmentally approriate construction of plastic parts, and are regulated along similar lines. I believe in the power of 3D printing to fix problems or revive a broken product, and have used it to this effect myself. This is a good promise, but a very small section of society thinks in this way, and have the requisite ability and access to be significant. b) We need regulation. Before you get all excited by my use of the word ‘regulation’ I use it cautiously. Whilst I agree that the very spirit of independent manufacture runs counter to the slow lumbering legal system, there needs to be some thought in this area. Once we move away from buying 3D printed parts to support a friend or Kickstarter project, once we stop seeing the objects as craft, we need to move into the world of true manufacturing and accept the responsibility that comes with it. We are undoubtedly in the Wild West era of 3D printing, but I think it’s right and proper that we question a system where an individual can make significant income from the sale of a part and have utterly no responsibility for the safety of the person buying it, or accountability for quality or environmental impact. Current regulatory systems are not suited to this type of manufacture but I feel we need to create a new framework for certification. I welcome any ideas to the debate. c) Emerging business models. I see 3D printing finding a home where it is currently most popular – as a prototyping tool and a hobbyist device. I’m not hugely swayed by the argument for widespread domestic 3D printing, at least not yet. We haven’t found a compelling use for such machines at a mass scale. I’m keen to see how companies such as Shapeways grow, how the balance between data sales, object sales and printing services shifts, that will be most telling. 3D printing will also expand out of the middle class hobbyist environment into low income rural spaces, warzones or developing countries. Perhaps then we will see something more interesting than a scanned bust of someones head. d) Response of big business. So what about all those huge corporations who currently spend billions on injection molding and shipping in bulk? In big business 3D printing is now referred to as ‘additive manufacture’ and many millions of dollars are being spent investigating the area. There are a few hindrances to a mass manufactured device which uses additive manufacture, namely time, finish, quality and material choice. 3D printing will most likely find it’s first commercial success not as a cosmetic part, but as an internal assembly. The benefit of additive manufacture is that it negates any requirements for complicated cores or tooling, making it more suitable than injection molding for complex assemblies. In parallel we can expect the integration of components into a 3D print rather than post assembly, which would again point at an internal use. Once 3D printing finds it’s ‘killer app’ it will seem entirely natural, but we’re still looking. Outside of a manufacturing shift, 3D printing also has the requisite futuristic cachet to make it attractive to advertisers and promotions. We may see it used as a direct mail or commercial outlet, just as we did with faxes towards the end of their widespread use. Ford could send you a little model of the new F150 for you to fondle and swoon over. Customers could print out approximations of objects to see how they look before we commit to an online purchase. Manufacturers may make more of their data open source to encourage and engage with the 3D printing community (just as Nokia recently did), adding customisation and personalisation options to a mass manufactured item. In parallel to individual regulation we also need to see how big business defends their patents and trademarks in an era where an accurate facsimile of a product can be independently produced. Perhaps we will see 3D watermarks or form recognition algorithms to prevent counterfeiting, just as Xerox machines can recognize and prevent the copying of currency. Big manufacturing doesn’t run counter to the 3D printing revolution, it just has it’s own uses for it. It’s my firm belief that 3D printing is here to stay, but exactly how it stays and for how long is the bigger question. As designers of the future we have a responsibility to embrace new making, but we should ensure that we aren’t swept along with the hype. There are big questions to be asked about this technology and it’s our job to ask them. I would love to build on this debate further, and will keep the comments section open. The importance of silos here in French-speaking Switzerland (and the francophone countries of Europe I would say): with so many “sub-communities” trying to exist, there is a tendency from people to differentiate themselves from others and not try to be part of a community. For instance, the debate about the difference between interaction designers and new media artists can be problematic for that matter. So… if it’s already hard to bring these two together, how can we expect start-up people to go to art exhibit! That being said, I’m sure there are exceptions. The idea that technology is for technicians and that it’s some sort of dirty thing that art should not really bother about. The fact that art related with digital technologies (video games, new media art pieces…) is part of popular culture, and hence less important than more noble realms of art such as theatre pieces, opera, contemporary dance or literature. Spending time in California for the laboratory activities (and having fun), this looks utterly weird and passé.